All children are different but most will start to recognize some of the letters in the alphabet when they are two or three and move on to identify most letters by the time they are four or five. As a parent, this means that if you want, you can start to teach your kid the alphabet at around age two. And you may want to know how to teach alphabet to your baby. First, don’t expect him to master all at once. You also need to keep in mind that toddlers learn in different ways than older children. Instead of using flashcards or audiotapes, use visual aids. When you use picture books with colorful letters your kid will enjoy himself by indicating the letters, colors, animals and shapes he knows. Read on for more fun ways to teach your kid alphabet. The very first thing you should do to teach your child the alphabet is getting him interested in hearing stories. Kids who frequently get read to will start to realize around two or three that books have print which has letters. Toddlers tend to enjoy stories with repeating word parents. No matter what type of books your child likes, give him books that he enjoys to make the learning process easier. If you do this, his interest in letters and printed words will happen whenever he is developmentally ready. 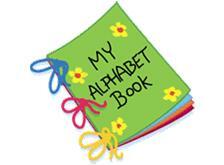 Here you can find books to help learn alphabet. Instead of buying a colorful alphabet book, you can get your kids involved and make one with them. Buy a blank paper book or simply make one using construction paper. Work with your child to dedicate each page to a letter. Either have him find the letter and cut it out or write it himself. Then cut out pictures to go with each letter. Also, playing games can help you figure out "How to teach alphabet" with trying various games. Here we list some games that can help you teaching alphabet to your toddler. The game where you turn cards face down and take turns trying to find matches – but use the letters of the alphabet. Either make your own or purchase a set of cards. You can even have them match lowercase and capital letters. Baking with your child can be educational. Either buy some alphabet cookie cutters or simply add the letters to the cookies using frosting. 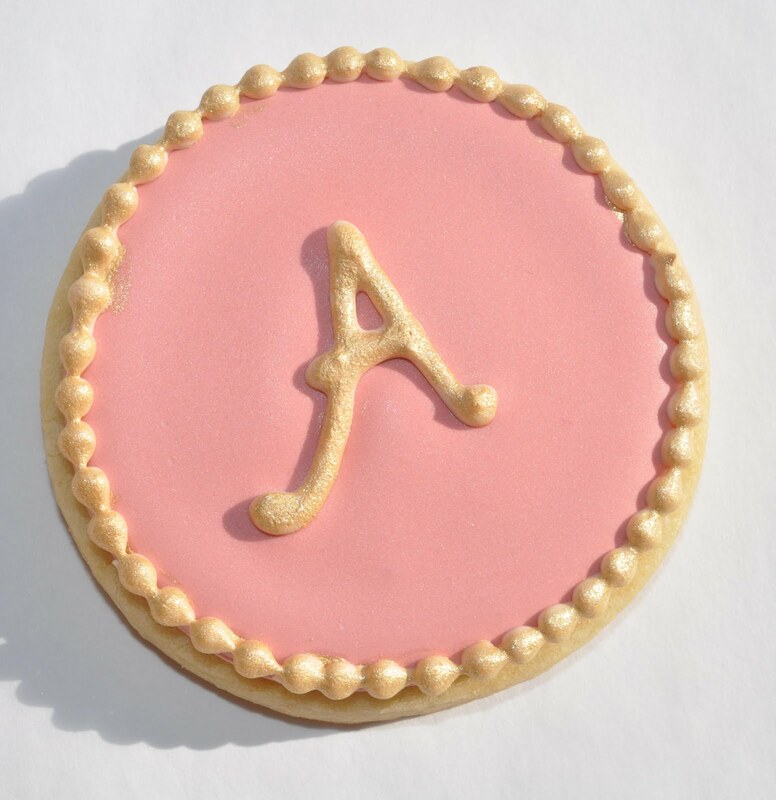 Ask your child to tell you which letter cookie he wants. Pick a letter of the alphabet and make a plan to make a photo collage. Buy a disposable camera and when you go out, have your kid take pictures of words and objects that start with the letter. Later get the pictures developed, cut them out, and make the collage. Be sure to have your child trace or write the letter to complete the collage. Go through the alphabet and help your child come up with a word that starts with each letter. Move from “A is an apple” all the way to “Z is a zebra.” If your child is older, you can even add a category such as animals or fruits. Get a large piece of paper and work with your child to create a finger painting including various letters. Ask him to paint both the capital and lowercase letters and then let him decorate it. To work on the letters and sensory skills, fill a bag with multiple objects like a book, pencil, and car. Let your child see what you put in the bag then ask him to close his eyes. Have him find the object that starts with a B (or other letter) without looking. Toddlers enjoy discovering their world with their sense. Take the time to cut large letters from cardboard. Then cover them in fun materials such as furry ones or sandpaper. 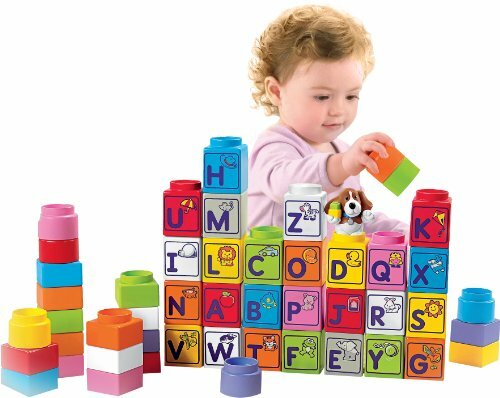 Let your child play with the letters and talk about the letter he is holding. 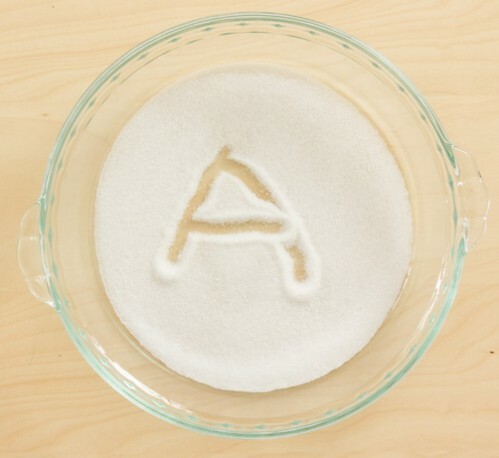 Another option is to put shaving cream or flour on the table and then let your child draw letters using his finger. Guide her fingers and hand to help him if she is still learning. This is also a great way to teach your child important words such as his name. After your child recognizes a specific letter, start playing word games. Ask him to think of words that start with the same letter. If your child is under four years old and doesn’t seem interested, don’t push him to learn the alphabet as learning it early isn’t linked to reading skills later on. If, however, your child is interested, work with him to learn even more letters. While making the alphabet cookies (or another similar treat) mentioned earlier, be sure to get your child involved. Let him pick the type of cookie you will make, mix the ingredients, and even spread the icing. Be sure to talk about letters and the alphabet while you bake. A good example would be asking what letter ingredients such as butter start with. You don’t have to make a cookie for every letter of the alphabet, but be sure to make one for your child’s name, each sibling, mom, and dad. You can even make ones with the first letter of pets’ names.